It is wise to understand the role and usage of "silence" in the business world. It is comprised of seven unique powers that can help you achieve business success. The secret, however, is to know how and when to use these powers in order to accomplish your goals and objectives. It is curious to observe that most people are uncomfortable with silence, and find it especially difficult to use and put into business practice. Since we live in a world of noises and constant audible distractions, the idea of silence almost seems non-existent. Think about this for a second. When are you actually aware of silence For example, maybe you notice it at night when you are sleeping, when you are alone somewhere outside during a vacation out in the countryside, or when you are reading a book in a quiet library. Nevertheless, something can always interrupt the silence in the three previous examples; for instance, the sound of your neighbor's voice, a dog barking at night, or the sound of a book falling on a table. 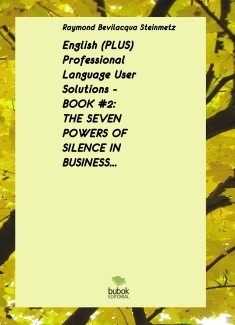 Discover the SEVEN POWER OF SILENCE that can be used in business.